Need a cover for any brand of spa? We've got a huge database of cover templates to match to your spa model. Quality hot tub covers for portable spas. Order your custom hot tub cover here. 4"-2" tapered spa cover standard, or upgrade to 5"-3" pr even 6"-4". Your provided measurements will be compared with our database for added accuracy. Custom spa covers are delivered with a full manufacturer's warranty, but are not returnable. Lead time is about 2-3 weeks. 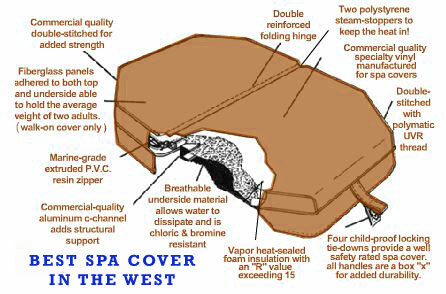 We offer in-stock, factory original QCA Spas hot tub covers and in-stock Emerald Spa covers. Just let us know the model name and we'll take care of the rest. If unsure, provide dimensions of your existing cover or contact us at info@hottuboutpost.com with measurements and we will confirm the correct spa cover for you. Don't settle for an imitation when you can get a factory original replacement cover. See all of the in-stock QCA Spa covers here. We also carry floating soft top covers, cover lifters and replacement cover locks or clips. Need help ordering a hot tub cover or don't know your spa model? Email support@hottuboutpost.com.